It was a damn long drive from Copenhagen to Tilburg. We left at 8:15 in the morning and did not arrive at the hotel until 19:38 in the evening! We rushed and checked in and got a taxi straight away to the venue. No one was playing yet so we got a quick kebab and then went straight in. Toner Low, a very toned down slow heavy band were playing and sounded quite cool. They had some pre-recorded effects and the singer was far out when he did sing with a lot of delay. This was just what we needed after the long drive and now we had a beer and a joint and were happy campers! Next up was a UK band (Level End of Boss) that none of us had ever heard of. The band is described as progressive groove metal. They for sure had some cool grooves and the lead guitarist played some cool psyched out stuff at times. They were quite complex and the singer reminded me of Metallica mixed with Voivod but with a bit of a stoner groove. They had a killer female bass player who not only looked great but rocked like hell! They were pretty cool but none of us liked the singer too much. Next up was Astrosoniq and we had listened to the Made in Oss CD in the car on the way down and were psyched to hear these guys live. And they did not disappoint at all! 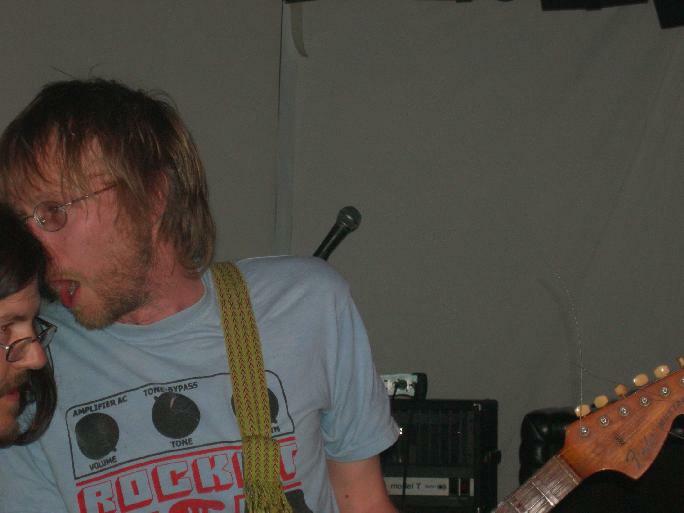 They started with a sort of bluesy jam that was quite cool and then hit us with the killer stoned grooves with some psyched out sounds made by one guy with some sort of effects unit and a sampler. Sadly he never did much very interesting as the band had plenty of cool spaced out music where a real spaced out synth player could have added a lot to the music. After a 15 minute jam the singer came out and appeared on a few tracks. The band played quite strange stuff but always kept it really interesting. A really great set. The final band of the night was Spaceship Landing from Germany. I had only heard the name but not the music and this band really blew us all away. The vocalist had a cool set up with a red lounge chair, sword, small flutes, tubes, harmonica, etc, on a table and a mixer (that they never seemed to get working). The bass player, drummer (who was really awesome!) and the guitarist filled out the band. I was told they had a organ player on the two shows they played before Roadburn but that he was sick. Anyway, they started with a really trippy Pink Floyd inspired piece before the heavy stuff began. Wow, they got into some really killer heavy repetitive grooves and the vocalist made all sorts of strange sounds and effects. We were totally transfixed. Think Circle or CAN meets Kyuss and Pink Floyd and you get something like these guys. I was really blown away. What a killer band. Nils bought the CD (wish I had as well) and it was also quite cool. I've got to look out for this band and get them to Denmark. The party went on for some hours but we took it easy and headed back to the hotel. Awesome first night and a totally cool venue. Just look at the line up of bands for one day and you knew this was going to blow your mind! It was a great venue as well with three rooms - Orange Factory Stage was in the Batcave, a smallish bar that holds about 150 packed like sardines; Green Room, which holds about 300 people and has a higher and much better stage and sound; and then the main concert hall which was amazing and holds about 1500 people I guess. 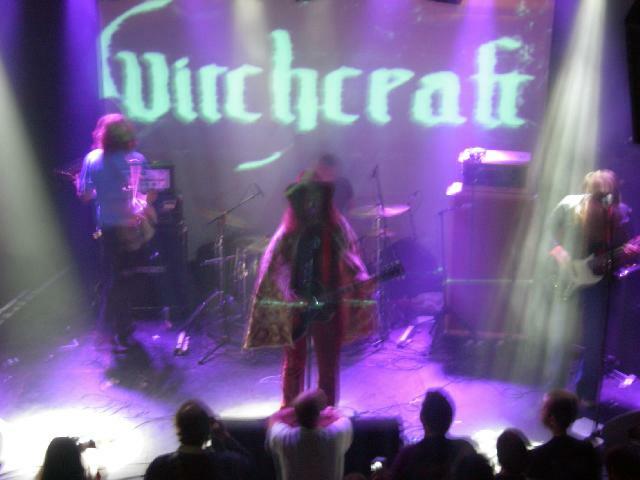 We got there in plenty of time to get a good place on the balcony above the Green room to see Witchcraft from Sweden. The band started off a bit weakly but caught up quite fast and played a cool set of early 70's inspired rock ala Pentagram, Black Sabbath, etc. I tried to see a bit of Abramis Brama but the room was so packed I could not even get close. So after one song I headed over to check out Spacehead on the huge stage. Great lightshow and visuals for all the bands on this stage and Spacehead, well, are Spacehead. They have some really cool songs but try too hard to be like Hawkwind and don't really try for their own sound. Quite a good crowd in there but they really had nowhere else to go as the other two rooms were packed to the gills so you have to see the bands in this room unless you showed up before the bands start on either of the other stages. I ran into a lot of friends from all over Europe, which was so cool and also missed a lot as well I found out afterwards! Magnus and I ran off to see a bit of Solace. Man these are big mean and tattoo'd guys. They also played a cool heavy opening groove jam but then the bass rig broke down and they had to take a long break so we split as the room was really hot and packed and the Bevis Frond would soon start. When we got back to the space rock stage they were nearly set up and they actually just started jamming like 15 minutes before they were suppose to start and that was the gig off and running. The Bevis Frond are a band I have seen many times but they have stopped touring and play very rarely. This was a special gig as well because they had 3 guitar players, namely Nick, Paul Simmons and Bari Watts. Unfortunately for us, Paul was too loud, Nick too low and Bari nearly inaudible, so it was not what it could have been. Anyway, some cool old songs like Well Out Of It, Maybe and Eyes in the Back of my Head were played as well as a few new ones and some classics like Stoned Train Driver and Hole Song#2. The band ended with the dreadful Down Time (should be called Waste of Time), where they have long band introductions and solos. I had left to go see The Heads. I got quite close up to the front with Nils and Tom for The Heads (had lost Magnus at the Bevis Frond when I moved to a better position to try to hear the guitars better. Anyway, I got to see about 25 minutes of the Heads and damn, they were loud (loudest band at the festival) and totally insane over the top power psychedelia! I loved it! I left in time to catch a beer and go see the Ozric Tentacles, one of my favourite bands. Sadly, the band is just going down the toilet as far as a live band. They have an absolutely crap soundman who makes the sound far too bass and drum heavy so that everything else is just drowned out or far back in the mix. Anyway, the band switched Ed's wife from synthesizers to bass and they brought in a new synth player, Paul, who played in Another Green World and other UK bands. It was a pretty standard set and Ed was spending a lot of his time coaching the new people along on the tunes. I simply could not enjoy it much and a lot of people left the room as soon as they came in on the floor as the bass was overwhelming. They played pretty much the standard set for the last year or so and new material, even though the new CD is out in a few months. 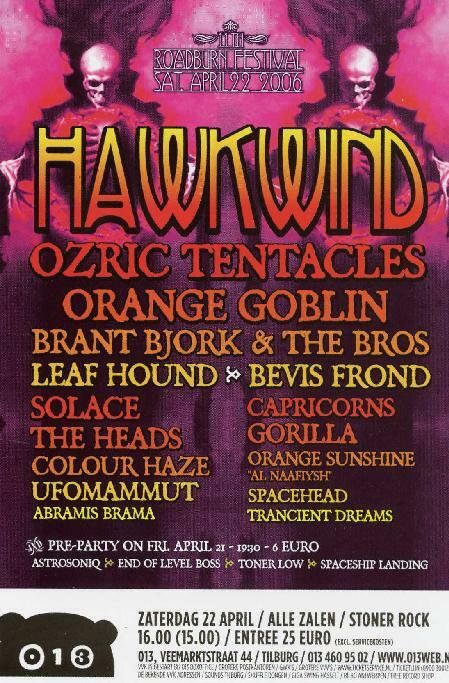 Now it was time for the main event, Hawkwind. I had spoke to Alan Davey, the bass player, the night before in the bar and he said that the light show was going to be mindblowing as they had a huge white screen and had brought like 7 projectors. And boy was he right. I have never ever seen anything so cool in my life. 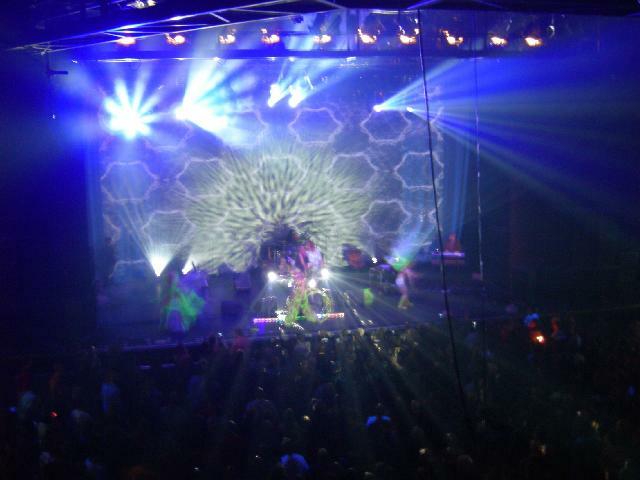 I was really blown away by Hawkwind and I have never experienced such a great light and visual show ever. I really liked the performers as well. They don't really dance. They perform. The set list was a heavy one as well with Lord of Light, Psi Power, Brainstorm, Greenback Massacre, Sword of the East, Assassans of Allah. Lots of old stuff as well with Paradox, Psychedelic Warlords, Upside Down, etc. I loved the show and got totally sucked into the whole vibe and the sound was amazing. My only doubt is that Jason plays these piano lines that follow the melodies on all the old songs (including Brainstorm, which they sound out of place). I wish he would make more spaced out sounds. They really need a synth player who makes the old fashion Del-Dik Mik sounds (Keith - where are you??) rather than a new agey piano player. But damn, they played great. I think it was the coolest show since I saw them in 1989. That was about it as I was totally exhausted. I saw one song of Gorilla and they were quite cool and heavy but after 100 minutes of sensory overload I needed a break and went outside. The others came out shortly and I ran into all sorts of people I knew from Germany, Sweden, Holland and Finland while outside. One of my friends, Ylli, was passed out against the wall and was surrounded by people and two bicycle police wondering if he was ok. I woke him up and took care of him and he got up on his feet and was talking to me in Finnish but soon his friends came to help him out and we headed off, hoping to be back next year.